1 of 1 Heat oven to 350 degrees . Coat 9-inch square baking pan with cooking spray. 1 of 1 In medium-size bowl, blend brown sugar, flour, cinnamon and salt. With pastry blender, cut butter into flour mixture until crumbs form. Chill. 1 of 3 Pour vinegar into a measuring cup. Add enough milk to equal 1 cup. Set aside. In a medium-size bowl, whisk together flour, baking powder, baking soda and salt. 2 of 3 In large bowl, beat butter, sugar and vanilla until fluffy, 2 minutes. Add eggs, one at a time, beating well after each. Working in batches, beat in milk mixture alternately with flour mixture. 3 of 3 Scrape batter into pan. Sprinkle with topping. Bake at 350 degrees for 1 hour, until a toothpick inserted into cake comes out clean. Cool in pan on wire rack. 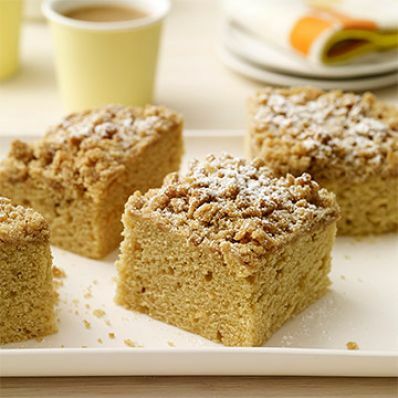 Dust with confectioners sugar; cut in squares. Per Serving: 240 mg sodium, 1 g fiber, 9 g sat. fat, 83 mg chol., 15 g Fat, total, 59 g carb., 6 g pro., 387 kcal cal.